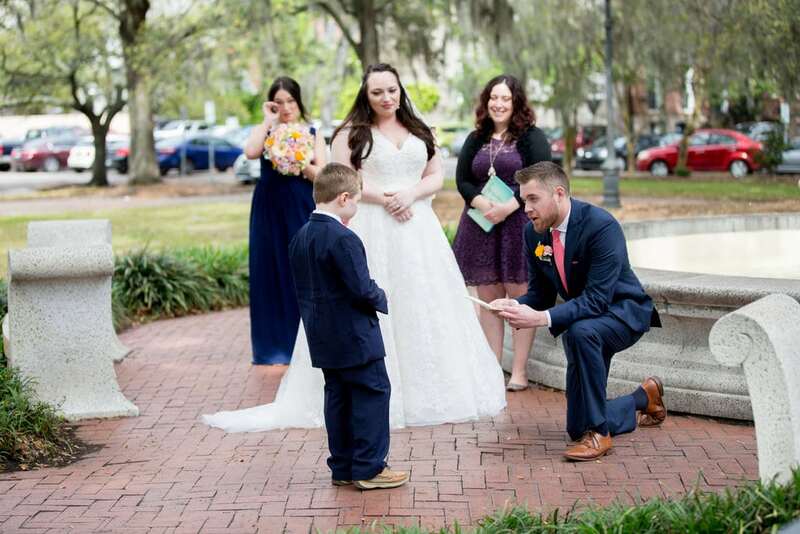 Our Ceremony + Photography packages are unique, creative and memorable ways to celebrate your love amongst the beauty of Savannah, GA.
Get married in one of our historic downtown squares or Forsyth Park in a personalized ceremony and then take photos together in a fun walking tour of Savannah’s sweeping Spanish moss and historic scenery. 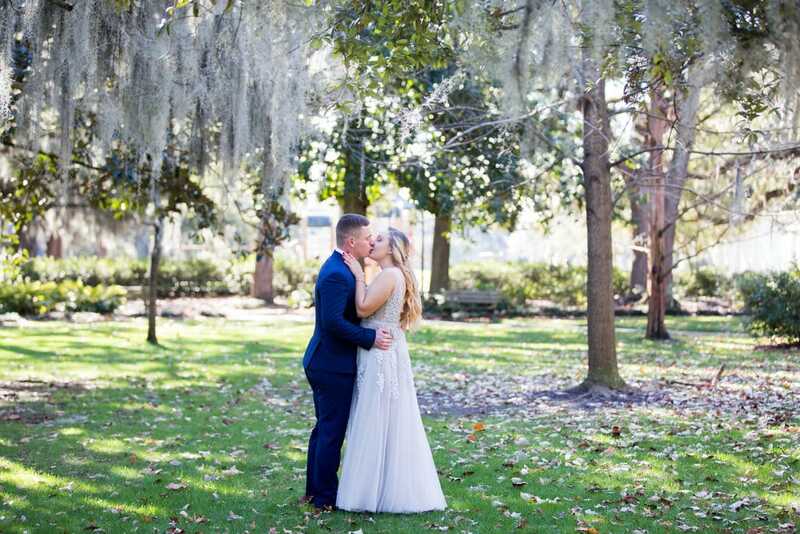 Whether you’re having a destination wedding, or are a local couple who wants to appreciate Savannah as a wonderful place to get married, officiant Tracy Brisson and photographer Megan Jones of It’s Megan Jones Photography will make your elopement or intimate wedding a day you will never forget. 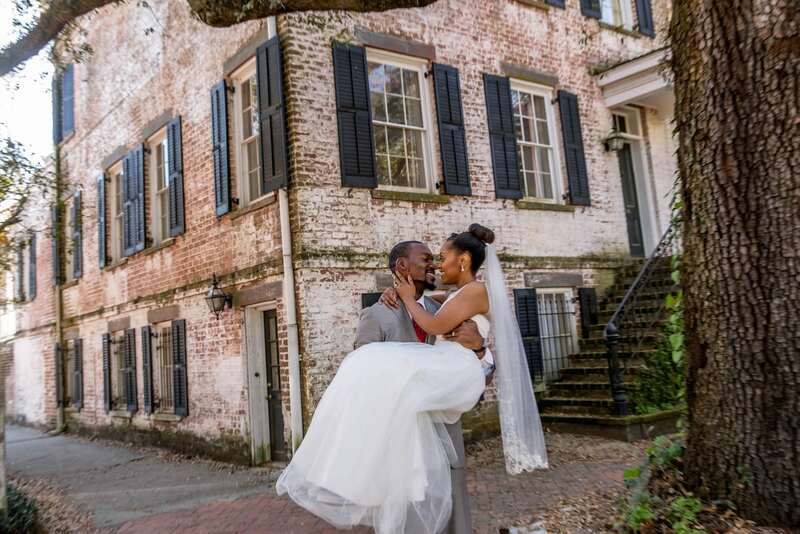 Savannah, GA is the perfect place for an intimate elopement or wedding for many reasons, including its natural beauty, location and year-round good weather. 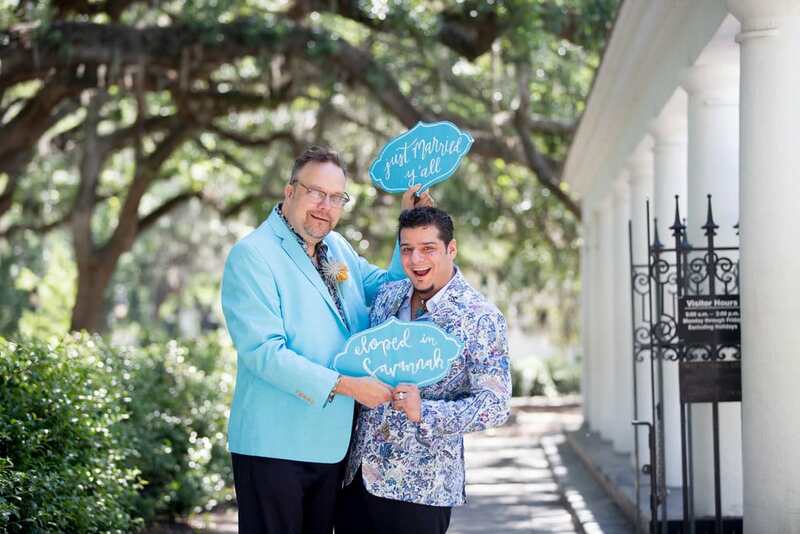 You can read even more about why it’s perfect on our Here Are 7 Reasons Why You Should Elope in Savannah, GA blog post! We work with couples from all different backgrounds and places around the globe, each with an amazing story, which is just one reason why we love what we do. If you are a couple looking for a fun, stress-free adventure for your wedding or elopement celebration, our services are perfect for you! We offer three Ceremony + Photography experiences to celebrate your love. The Savannah Elopement Experience is our most popular Ceremony + Photography package and includes these services. A personalized ceremony in a square or park that includes a personalized ceremony and any special elements such as requested readings or rituals. 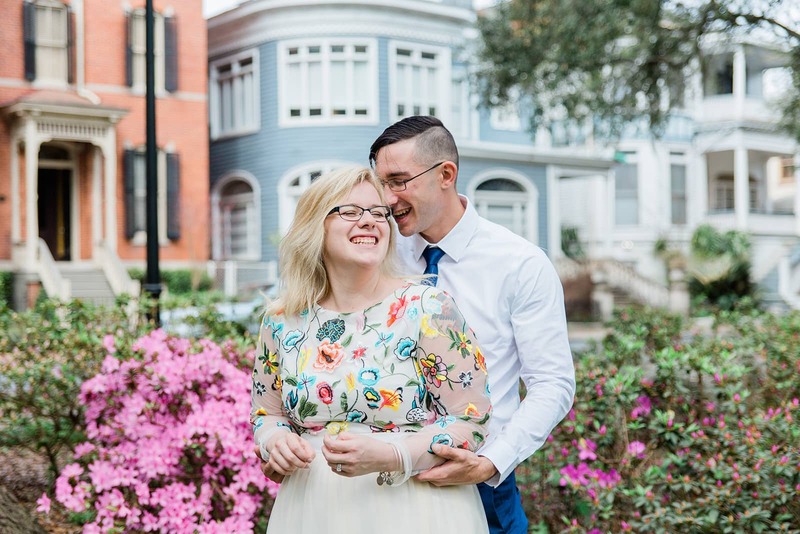 A newlywed photoshoot among the beautiful trees, squares, and landmarks of downtown Savannah, immediately following your ceremony. An online digital gallery of professionally edited photos from our one hour together that you can use to view, share, download, and print your pictures from within two weeks of your ceremony. A Client Concierge to take care of your elopement to-do items like booking hair and makeup, arranging dinner reservations, ordering your bouquet, and many other related tasks. Unlimited email consultations leading up to your wedding day to answer any questions you have about your ceremony and visit to Savannah. An optional extra hour of photography via pedicab, with cupcakes and champagne, through our Adventure Hour add-on. You can invite up to six guests with one of our elopement packages. A pre-written ceremony, performed in the square or park of your choice. A short, mini-portrait session with the couple in the same location as the ceremony. An online digital gallery of professionally edited photos from your time together (about 20-25 minutes total) that you can use to view, share, download, and print your pictures from within two weeks of your ceremony. Optional ceremony customization and concierge add-ons. This elopement package is also limited to 6 guests. Finally, the Intimate Destination Wedding package is for those who like the elopement vibe, but want to host a larger celebration with a group of dear family & friends. This package includes the following services. A one-hour ceremony planning consultation with Tracy. 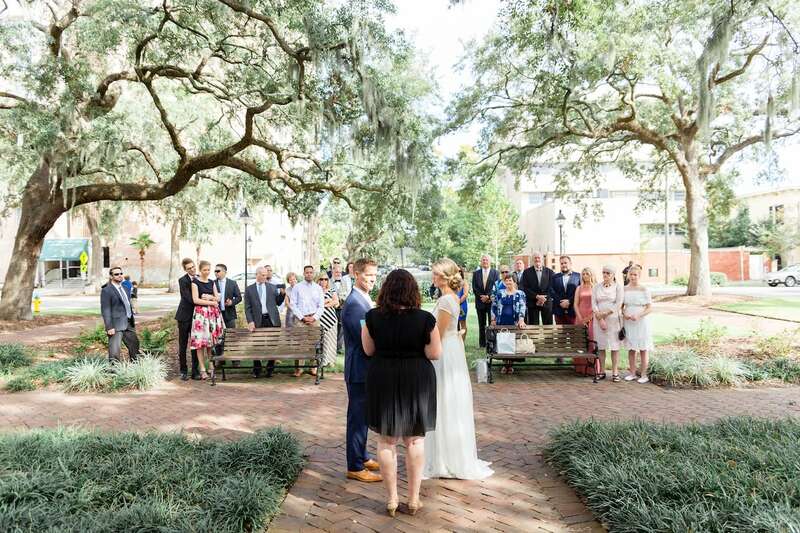 Two hours of photography, including the ceremony, guest photography, and a newlywed photoshoot among the beautiful trees, squares, and landmarks of downtown Savannah. An online digital gallery of professionally edited photos from your time together that you can use to view, share, download, and print your pictures from within two weeks of your ceremony. A Client Concierge to take care of your wedding planning items like securing permits, booking hair and makeup, arranging post-ceremony celebrations, ordering your bouquet, and many other related tasks. You can invite up to 30 guests for this package. The location permit, if needed, is not included. Tracy was so professional and made sure our ceremony was beautiful. Tracy was the best money we spent on our wedding. I know she’s just the officiant but she does so much more than that. Shannon helped me plan it all and kept me on schedule for everything. Tracy was so professional and made sure our ceremony was beautiful. We had a bunch of family members tell me how great the ceremony was and how much they enjoyed listening to Tracy. I’m so glad I got her, and I highly recommend her!! Your team for the day, Tracy and Megan, are ecstatic to help you have the perfect Savannah elopement or intimate destination wedding. I’m Tracy and I write and perform ceremonies that are authentic and meaningful to my clients. I’ve won multiple awards for my work and am the only local officiant to win The Knot’s Best of Award two years in a row. My goal is to keep your day simple and stress-free so you only have to focus on each other! I’m Megan and I photograph people and places at their most beautiful. I’ve won Savannah Connect’s contest for Best Wedding Photographer two years in a row. I’m excited to illustrate the love you have for each other on your special day! 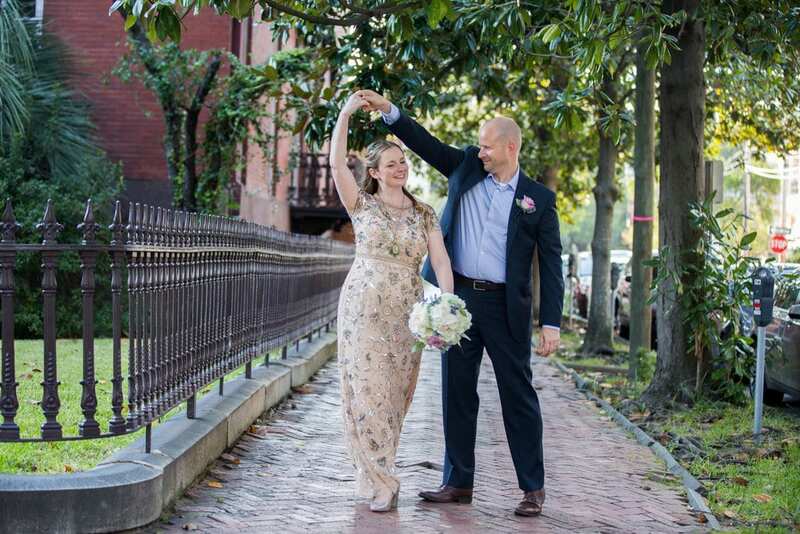 We take great pride in our work and were excited that one of our photos from a Savannah Elopement Experience ceremony was featured as one of the Huffington Post’s best wedding photos of all of 2018 (see photo 5!). PS: When Tracy is already booked, we have awesome Partner Officiants who can lead your day. We’ll let you know who we recommend during the booking process. 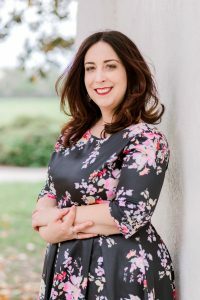 When Megan is booked, we also work with Partner Photographers, Ashly of Matthew & Ashly Fine Art + Films and Rich Burkhardt of Photos by Rich, two of the other best photographers in town. Anything you want, whether it is casual wear or formal bridal attire! Since we’ll be walking, make sure you wear comfortable shoes. Savannah streets and sidewalks include cobblestone. We have a “style guide” that features outfits that other couples have worn. We have worked with over 400 couples so this is only a very small sample. If you have at least two hours of photographs and pedicabs, you can get even more beautiful locations as part of your experience. You can also look at photos of actual couples from their portrait sessions and newlywed walks in our galleries. We cannot guarantee perfect weather for your date, but if it rains, we will have still have fun. You can check out how we’ve worked with rain in the past to make sure you enjoy your experience and leave with beautiful photos. Interested in booking one of these packages? Fill out the form below and let us help you book your package! If you are simply looking for a Savannah wedding officiant for your ceremony, check out our Ceremony Only packages.